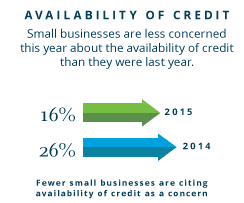 Says Chase in its 2015 Small Business Leaders Outlook report. Main Street continues to expect continued recovery after the recession. 2015 numbers are across the board stronger than in 2014. Main Street expects higher revenues, profits and continues to be optimistic about the US economy. Over 25% will be adding full and part-time employees. Notably, concerns over health care costs and taxes have dropped. My take is Main Street continues to spend its energy to find ways to improve their own businesses, and not worry too much about the larger economic macro issues.